Google Earth allows us to traverse the globe in a heartbeat, and look down on our world. 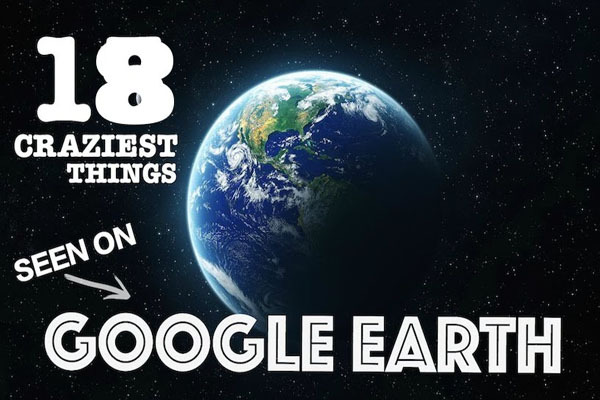 Here are some of our favorite things that you can see on Google Earth. Can you find anything better? A sizeable shipwreck is on Wingate Reef off Sudan. The S.S. Jassim sank in 2003 and now is one of the largest shipwrecks visible. This giant pink bunny, bigger than a house even, is just laying in this field for some reason. What is it for??? Remember that cruise ship that turned over and was in the news nonstop for a while? Yeah, you can see it on google maps now! This field is a huge graveyard for retired planes. There’s just so many! #14 A Wet Dog” …Or Murder! Rumours have flown everywhere surrounding this picture. It’s hard to tell whether we’re looking at a bloody mess of a murder, with a lake to hide the body, or just a wet dog running to it’s owner. As you can see from the search, in Zakouma National Park you can zoom in just far enough to get a really cool look at a herd of elephants running through the grass. The herd is just barely visible, being cut off by darkness. Seeing a tremendous herd of water buffalo, possibly over 200, making a dash across the Kigosi Game Reserve in Tanzania is a once-in-a-lifetime experience. Wouldn’t want to be there, so we can watch! Love is expressed in many ways, and a heart-shaped lake expresses the sentiment perfectly. It is found in Columbia Station, Ohio, complete with trees for a border. The Largest Lips can be found in Darfur, Sudan in desert land. The Lips are actually hill formations, which account for the shading in color. Colonel Sanders of KFC makes a spectacular appearance just off the Extraterrestrial Highway in Nevada. The Colonel represents how Mapvertising has grown ever since Google discovered how interesting images can look from space. A tremendous triangle, with five concentric circles inside, is in the sand of Nevada. There are several strange patterns across Nevada. Makes you wonder…. Lions have been the emblem for the UK for hundreds of years. In Dunstable, UK, a huge Regal lion stands watch in the field. Firefox has a unique logo, and in 2006, Oregon State University Linux users created a giant Firefox logo in a cornfield in Dayton, Oregon. It is 45,000 square feet and was made in honor of Firefox’s 50 millionth download. Tanzania is a pristine country where Google Earth found hundreds of hippos bathing in the giant pool in the Katavi National Park. Make a game of it; count the hippos! Yellowstone National Park is filled with amazing natural beauty. The Grand Prismatic Spring, with its spectacular and brilliant colors, is found in Wyoming. Beautiful! In the middle of the desert, outside Eloy, Arizona, there are five landing strips that have never had a plane either coming or going on them. So you have to wonder, are extraterrestrial friends planning on a visit? A tremendous triangle is in the middle of a field is in Wittman, Arizona. The isosceles triangle creates a road with no way out. Phantom Island was found in 2012, and then lost again the same year! Australians discovered the island near New Caledonia, and sent a ship to confirm it’s location, but it was not there. Spooky! #17 is just weird. Either google placed it there or somebody has too much time on his/her/its hands.